U.S. Secretary of Defense Chuck Hagel announced Thursday the presidential appointment of Marine Corps Gen. Joseph Dunford Jr., former commander of the Camp Pendleton-based I Marine Expeditionary Force, as the 36th commandant of the USMC. 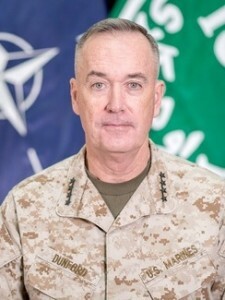 Dunford, who currently serves as commander of the U.S. forces and international security-assistance forces in Afghanistan, was in charge of the northern San Diego-station I MEF for about 13 months, in 2009 and 2010. He was assistant commandant of the Corps from October 2010 to December 2012. As a general officer, the 58-year-old Boston native has served as assistant division commander, 1st Marine Division; director, Operations Division, Plans, Policies and Operations, Headquarters Marine Corps; deputy commandant for Plans, Policies and Operations; and most recently as commanding general, I MEF and commander, Marine Forces Central Command, according to the Pentagon. Dunford is a graduate of the U.S. Army Ranger School, Marine Corps Amphibious Warfare School, and the U.S. Army War College. He holds master’s degrees in government from Georgetown University and international relations from the Fletcher School of Law and Diplomacy.